A green shirt, a purple ski jacket, blue jeans, white and pink Adidas sneakers, and titanium orange-colored glasses. Unknown. 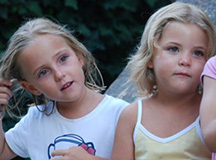 She and her twin sister, Alessia Vere Schepp (photo at right), were last seen around 1:00 p.m. in the suburb of Lausanne in Saint Sulpice, Switzerland. Their father, Mathias Schepp, was hit by and killed by a train in an apparent suicide near the railway station of Cerignola, Italy on the night of February 3rd, 2011. 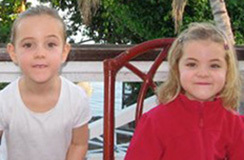 The girls' whereabouts are unknown, and their case remains unsolved.